My Mom is visiting me at the moment. It’s been great having rotating cooks in the kitchen. Among visiting some of our favorite local spots in Switzerland, recently we traveled to Morocco for one week. During our trip, I unfortunately caught a slight case of food poisoning, after eating chicken from a small restaurant. After this experience, the sight and smell of any type of meat makes me slightly nauseous and sick. I’ve never been a big meat-eater as is, but for the time being, I’m avoiding it until the desire to eat it returns, if it ever does. Despite my little incident, the trip was fabulous. Morocco is one of my favorite countries to visit, the landscape is so diverse and the people are very warm and welcoming. We spent a lovely evening in an old fortified mountain town, Ben Ait Haddou. Our riad hosts were so wonderful, we didn’t have to leave the hotel for entertainment. They served us a 4 course dinner consisting of: cucumber, tomato, onion, lemon and olive oil salad served with Moroccan country bread, followed by a chicken and vegetable tagine, full of yummy goodness, a lovely plate of the sweetest watermelon I’ve ever tasted and of course the customary mint tea – infused with thyme. After stuffing us to our capacity, the hotel owner serenaded us with traditional Berber music and then handed out drums to everyone and that’s when the party started. We danced, sang to songs we didn’t understand and laughed until the wee hours of the night. Unfortunately, I was too busy chomping away to snap pictures of the food. Now that I’m back home, I’m just having fun testing out some new and interesting veggie recipes. I recently found a recipe that combines some of my favorite things, savory and sweet, breakfast type food at dinner time. This was a big hit at the dinner table. It’s light enough for a nice summer dinner, simple enough to prepare in under 30 – 40 minutes and fancy enough to impress your friends at your next dinner party. Heat the balsamic on medium, once it decreases to about half the original amount, add your brown sugar. Stir frequently until the sauce thickens. Remove from heat and allow to cool. Once cool, drizzle over your salad (and pancakes too if you’d like). Mix flour, baking powder, a pinch of salt and rosemary in a bowl. Mix milk and egg in another bowl, make a well in dry ingredients, pour in, mix. Place the batter in the fridge until you’re ready to use it. Slice up zucchini, cook in olive oil and butter until slightly brown (about 3-4 minutes on each side). Add your goat cheese and zucchini to the batter, folding the ingredients in carefully. Using a ladle or big spoon, scoop mixture in an oiled pan on medium high heat. Cook about 3 minutes on one side or until bubbles start to appear, flip and finish cooking. Serve these pancakes right away, warm and with dip them in your salad sauce for a savory and sweet treat. This recipe makes about 6 medium-sized pancakes, so enough for 2 people. How I love Sundays. Even if it signals the end of the weekend, it truly is my favorite day. I usually wake up slowly, catch up on the news, read and enjoy lounging around in my pajamas until noon. Sometimes I dare to even take a stroll to the bakery to buy a moist loaf of tresse/challah bread. You’ll rarely find the Swiss strolling around or running errands in their PJs, especially on Sunday. I’ve realized over the years this is something very American. The Swiss on the other hand dress to the nines on Sunday. I just don’t see the point of changing into clothes, if my mission is to buy bread and go back to my lazy Sunday program. Since I didn’t have any buttermilk and am not too impressed with the milk and vinegar alternative, I used plain yogurt. I topped my pancakes with a mixed berry compote, butter and maple syrup (no need to hold back). The result was rich, fluffy, slightly tart, delicious pancakes. Preheat your oven to about 100 F/ 50 C and place a pan/casserole dish with a cover inside your oven. Mix all your dry ingredients. Make a well in the middle. Mix all your wet ingredients, stir them into your dry until combined. If the mixture if really thick you can add a little milk or water to thin it out slightly. I added about 4 TBSP of milk. Heat a pan with oil, once hot spoon out your pancake mixture into the pan. Flip the pancakes when many bubbles form on top. Place cooked pancakes in casserole dish, to keep warm before serving. Place all of your ingredients in a sauce pan, simmer on low for about 15 minutes. A dear friend visited me over the holidays. She came bearing all kinds of lovely goodies, including a Colombian cookbook. I’m looking forward to trying out some of the recipes. After a day of sight-seeing, she kindly demonstrated how to make arepas, Columbian style. An arepa is a baked, grilled or fried corn patty, typically served with meat, cheese, eggs or vegetables. I absolutely LOVE arepas, they’re so nutritious and practical. I usually make them Venezuelan style. This type is thicker and eaten in a similar fashion to a hamburger — you slice the corn patty open and fill it with your ingredients of choice. My friend told me the Colombian version is much thinner and you typically put the ingredients on top of the arepa. Tonight she prepared some arepas for me and my husband. I took a night off, observed her in action, set the table and prepared a little mixture of rucola, garlic, lemon and olive oil to go with the arepas. The below recipe makes 7 – 8 medium-sized arepas. Pre-heat oven to 200F/105 C. Place an ovenproof dish in the oven. Pour corn flour in a bowl.Add in 1 tsp of salt. 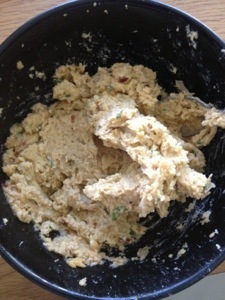 Gradually add water 1/2 c water at a time, mixing with your hands each time to incorporate the dough. Once you add all the water, the mixture should form a ball. The dough shouldn’t be too dry nor too wet/sticky. Place just enough oil in a pan to coat the bottom and heat the pan on medium-high heat. Take a handful of the dough and flatten it with your hands to form a flat circle. Use your fingers to smooth out the edges. Place the patty in the oil and fry until golden brown, carefully flip it and do the same for theuncooked side. Place the arepa in the oven-proof dish and cover to keep warm. Continue until you finish cooking all arepas. Cover the arepa with your ingredients of choice. I added cheddar cheese, tomatoes and rucola tossed with garlic, lemon and olive oil. Who’s looking forward to the next couple of days off? Me! Last week was the kind of week, where I managed to get just enough sleep to stay sane, woke up, dashed in and out of the shower, grabbed some fruit and ran from train to work and class. I’d come home in the evening to a pile of clothes that eventually turned into a mountain and just pop some type of vegetable in the oven and hope for the best. I only have a cat, so chapeau and lots of respect to those with children, I don’t know how you juggle it all! Any how, on my way home from teaching last week, I had a bit of time until my train arrived, so I popped into an African grocer near the train station. At the grocer’s I found okra, a staple vegetable from my childhood. I haven’t had it in years! Back then, I ate it battered and fried– no surprise there, what isn’t battered and fried in Alabama, hehehe! Anyway, this was one of my favorite childhood veggies. In another attempt to just pop something in the oven and save time and stay healthy, I accidentally made the best okra I’ve ever had! It was tangy and flavorful, with a beautifully browned crunchy crust. Some people are turned off by okra because it can be a little slimy in texture. This recipe is really nice for those who avoid okra for this reason. Wash your okra and pat it dry. Place okra in a bowl, add about 2 TBSP of olive oil (depends on how much you’re making), season with salt, pepper and curry. Roast on 425 for 15 – 20 minutes, or until browned and slightly crisp. 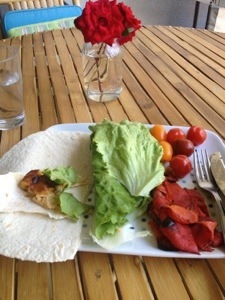 I served this with salad, fruits and cheese – as I was looking for a quick healthy lunch. Enjoy! A couple of weeks ago, I ate dinner at a friend’s. At some point during the evening she removed a loaf of bread from the oven. It was the most lovely shade of amber. She told it was naturally leavened bread that she made using a homemade starter (culture of yeast and bacteria). Me, being the curious cook that I am, and lover of anything natural and healthy, decided to make my own starter and try my hand at sourdough bread. I won’t go into details about the chemistry of the process, I’ll leave that to the experts and will instead put some links at the bottom of the page. I will try to walk you through my process for creating a starter or levain to bake your first fresh loaf. Patience and faith that it will work out. If your tap water is drinkable, use it. Many recommend bottled water, because it could contain small levels of chlorine, which inhibit yeast growth. To remove chlorine, leave a glass of water out overnight and it should evaporate. 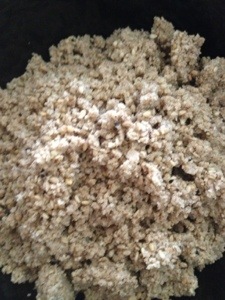 In a bowl mix 1/2 c of flour (50 grams) and a little less than 1/2 cup of water (app. 1 deciliter). Many bloggers use a total hydration method that entails mixing equal amounts of flour and water. Using slightly less water worked better from me, it stopped the mixture from separating. This could depend on the environment you live in. It’s all about trial and error. Pour the mixture into your clean jar. Cover partly. Do not close the lid completely, as the culture of yeast will produce carbon dioxide gas as they metabolize sugars. This causes the dough to rise, which is what we want to see, however the gases also need room to escape the jar. You can partially tighten the lid or punch a few small holes in cling wrap and cover it with this instead. 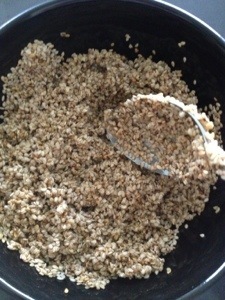 About 12 – 24 hours later, on days 2 – 7 (or longer), stir the mixture, get rid of half. If you use a scale and when you weigh your original ingredients, it will be easier to know precisely how much mixture to remove. Otherwise, you can eyeball the mixture or pour out 1/2 cup. Place the rest in a bowl and add in a little less than 1/2 c water stir, stir in 1/2 c flour, partially cover and let it sit overnight. Repeat every day. By days 4-7, your mixture should bubble and rise consistently, if not, continue feeding it, until it does consistently. Every other day, clean your jar out. This is important to determine, whether your starter is rising. I put a sticker on my jar at the level of the starter to confirm that it has risen. Do not use the starter until day 7 or later. If your starter is not doubling, place it on top of a warm appliance or in my case on a heated floor. If you experience a layer of separation between the liquid and the starter or water on the surface, try reducing your amount of water. Day 1. Starter/Levain. 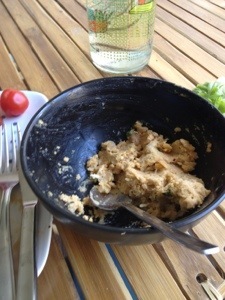 After your starter is established on day 7, maybe later, remove half and place it in a jar or a large bowl. Note: After your starter is established, you can use the 1/2 that you remove to make pancakes, as scraps in biscuits, pass it along to a friend, etc. Pour in water (slightly less than 1/2 c), mix, add in 1/2 c flour. Cover with cling wrap and let this mixture sit over night or 12 – 24 hours, until it has doubled in size. Day 2. Making the sponge: In a bowl, add a 1 cup of lukewarm water to your levain, mix until slushy, then add 2 c. (100 grams) flour. Cover with cling wrap and place in a warm place. Let this mixture sit 6 -8 hours or overnight. Day 3. Making the dough: In a separate bowl, pour in 2 cups of flour. In a cup, mix water in a cup with honey (optional). Mix this in with your flour, until it forms a rough ball. Let the dough sit for about 15 minutes so the flour can absorb the water. Sprinkle 2 tsp of salt over the dough and combine this with your sour dough sponge until incorporated. Don’t be afraid to get a little messy. You could use your kitchenaid to do this, since I don’t have one I did it with a spoon and by hand. Do not knead. 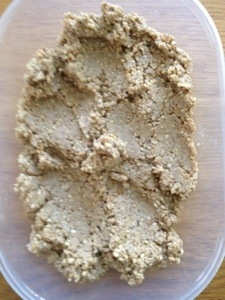 Shape as desired and place it in a lightly oiled baking dish and allow it to rise in an oiled bowl for 4-7 hours. If you do this in the morning, you’ll have bread for the evening. 30 minutes before baking your bread, preheat your oven to the about 440 F / 230 C. Boil about 3 cups of water and place in an ovenproof dish. Place this dish on the bottom shelf of your oven. This will help the crust turn a nice amber brown and provide a moist baking environment. Place the dough in the oven and bake for 50 minutes or until it sounds hollow when tapped. Half way through baking, reduce the temperature to about 400 F / 200 C. Allow the bread to cool on a wire rack. Try your best not to slice the bread until it’s cooled. There are tons of creative ways to shape and form the dough. Since this was my first attempt, I wanted to start simple. This bread tastes remarkable, slightly acidic, with a nice crunchy exterior and moist and airy inside. I would like to work on getting more air bubbles in my dough, practice makes perfect. Please note: Store starter in glass, plastic containers or stainless steel. Clear containers make it easier to observe your starter. I will warn you, you will become obsessed with your starter. It looks likes a creamy blob of water and flour, but somehow you will regard it as beautiful. Like me, you may come home and instead giving your husband a hug as soon as you walk in or feeding and cuddle your cat, dog, what have you not, you will run to your starter and observe it. Somehow, it will become part of your family– just be sure you don’t neglect your family members. Another warning, making naturally, leavened bread is not a time-consuming or arduous task, the yeast and the bacteria do most of the work, you just have to mix here and there. However, it is a long process that requires a lot of patience. Especially, if you decide to make your own starter, you’ll have to wait 1 to 2 weeks until you taste the fruits of your labor. Let me tell you, it is SO worth it. Have you made sourdough bread? Any tips/tricks, recipes you’d like to share?